This restaurant is located in a residential area about 8 minutes away from Nijo Castle. It’s famous for its Tantanmen. Though it’s far away from the larger streets, it’s easy to spot because of its location at an intersection on the road. Tantanmen are originally from China, and it’s ramen in a spicy soup flavored with hot peppers and chili oil, topped with minced meat. In the noodles at Gouriki, spiciness and a savory fragrance coexist to create a noodle that you’d want to eat again and again. There aren’t that many employees there despite the popularity, so during lunchtime you may have to wait. But it’s still worth trying at least once for spicy food lovers. The mix of spiciness from hot peppers and chili oil and the smell of freshly grinded white sesame is a unique characteristic of the soup here, which goes well with the extra thin noodles. The texture of nuts is a good accent. If it’s not spicy enough, you can add more chili oil from the table (the red liquid with sesame seeds in it). A dish with no soup. Mix it thoroughly with the Doubanjiang sauce underneath the noodles and the hot sauce made from a variety of spices and enjoy. It’s not as hot as THE・Tantanmen. The scallops are delicious when eating with the noodles. A rice and egg set that is served after your Tantanmen. (What’s inside is different according to which Tantanmen you ordered. The photograph is the shime no gohan. that comes with THE・Tantanmen) Leave some of the soup or toppings from your Tantanmen to pour on your shime no gohan. You can order extra noodles for those who “want to eat just a bit more!” Leave about half of your soup, and add the noodles. Untangle the noodles well and enjoy. First, buy a ticket from the ticket machine outside the restaurant. 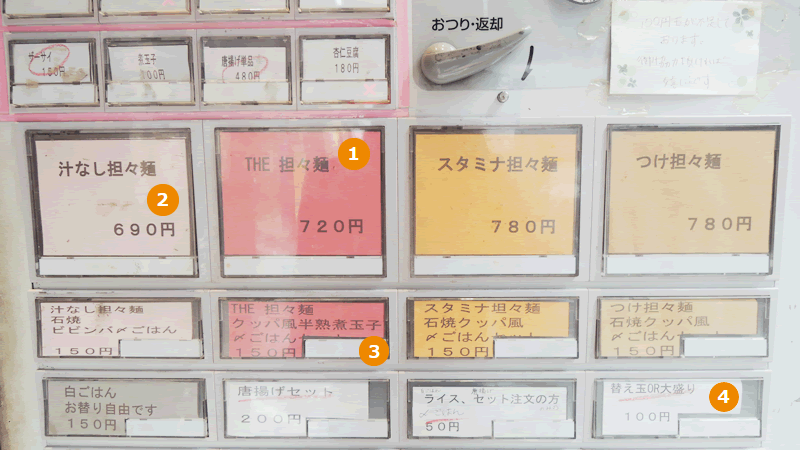 Enter a coin, and push the button for the ramen of your choice. Then, pick a rice dish to eat after the noodles, or extra noodles if you want some. When you push down the lever, a ticket and change will come out. Enter the restaurant and hand the ticket to an employee, and you’re done ordering. If you want to ask how spicy a dish is, ask the employee: “Tantanmen ga donokurai karaika oshietekudasai.” Please tell me how spicy the Tantanmen is. We recommend this restaurant to anyone who loves spicy foods. You might start sweating because it’s so hot, but it’s so delicious that it’s almost addicting. 10-minute walk from Subway Karasuma Oike Station. May be crowded between 12:00 and 14:00, and you may have to wait.